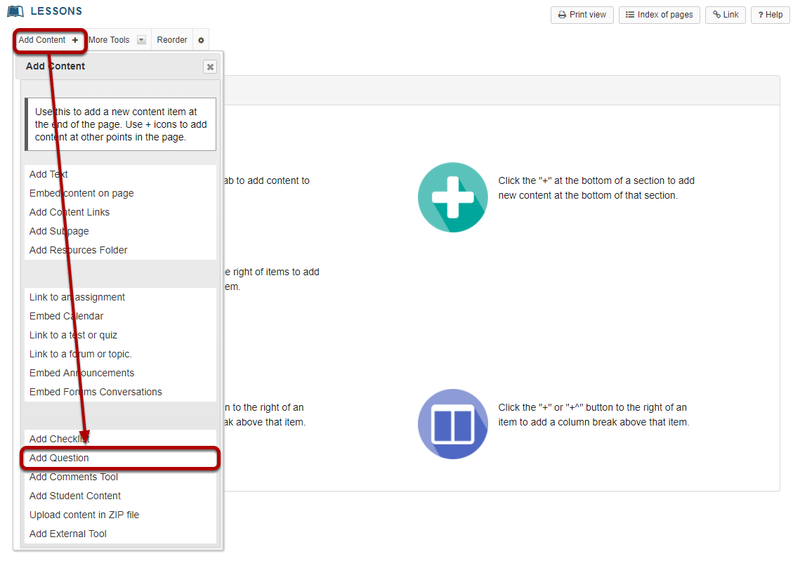 Sakai Guides and DocumentationSakai Complete User Guide LessonsHow do I add an in-line question to a Lessons page? 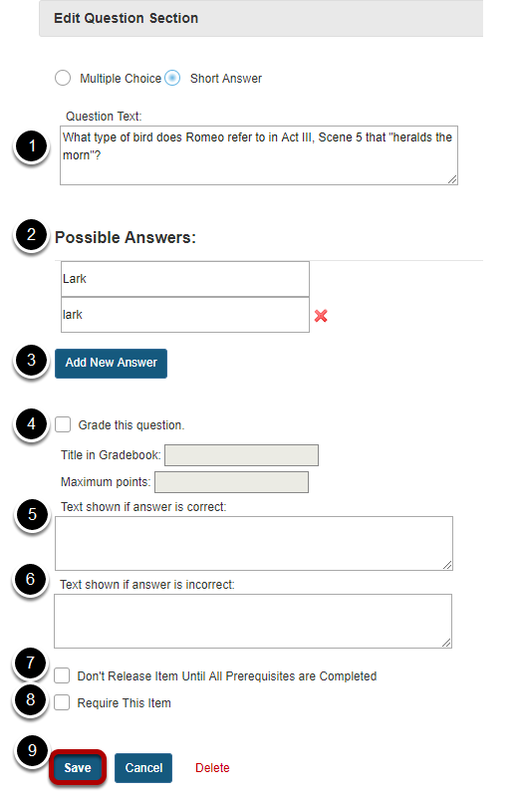 Instructors can add either a Multiple Choice question or a Short Answer question directly to a Lessons Page. The questions can either be in poll form (no correct answer) or in graded form (correct answer). Click Add Content, then Add Question. Zoom: Click Add Content, then Add Question. From the Add Content drop-down menu, select Add Question. Add the question text and any additional settings as needed. Enter the possible answer choices. Check the box next to Don't release until all prerequisites are completed if you want to restrict this item based on completion of a prerequisite. Click Save to save your question and return to the Lessons page. View question on the page. Zoom: View question on the page. To see student responses, click Show Grading Pane. Zoom: To see student responses, click Show Grading Pane. 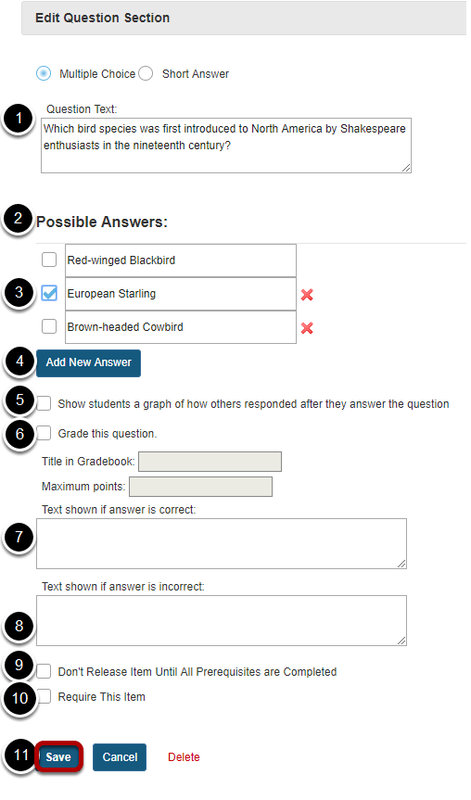 To see student responses, click Show Grading Panel. Zoom: To see student responses, click Show Grading Panel. This will display the student grades and responses. Prev: How do I add tests and quizzes to a Lessons page? Next: How do I allow comments to be posted on a Lessons page?